The first encounter with painting is often a delight and a surprise. Each color is a delicious revelation; strangely satisfying forms appear; we’re amazed and fascinated by the mysterious images that emerge. And the room feels safe—a supportive, inspirational community of people working together at their growing edge with no obvious comparison or judgment in the air. The experience is exhilarating and freeing. I noticed this freshness and unguarded innocence early in my teaching career when I worked with young children. After it sunk in that they were not expected to perform, the children would drop the stereotypical images fed to them on a daily basis and would begin to paint what was important to them. Whether it was their family or their home or some fantastic creature of their imagination, their paintings carried the unmistakable stamp of the real. Few things are more touching than seeing an innocent child deeply engrossed in the act of painting. When there was no thought of production or award, their gestures were purely creative. To safeguard this authentic expression, I had a rule that might be impossible today, given the understandable precautions that have grown out of the awareness of abuse. The rule was that no adults, other than myself, were allowed in the painting studio. When parents came to pick up their children, they would have to wait in the foyer until the class was finished. The kids loved it. It was clear that they felt a special respect and quality of freedom by having their own protected space. I would meet with the parents at the end of each three-month series, holding the finished paintings until that moment, so I could talk with them about the class. Often it was a revelation to see a reflection of their child’s creative life that was unlike the information coming from goal-oriented classes. Once they got over the stock question—Does my child have talent?—they would begin to realize the profound nature of the journey represented in the sequence of paintings. As I explained how disruptive it is to single out a particular painting as a favorite or in any way make the product more important than the living presence experienced in creating the paintings, they would usually become allies in my quest to protect and preserve the child’s true creative nature. Because of my time working with children, I began to see adults in a similar light. In many ways, we’re just older kids, especially in the qualities of innocence and openness still available to us. 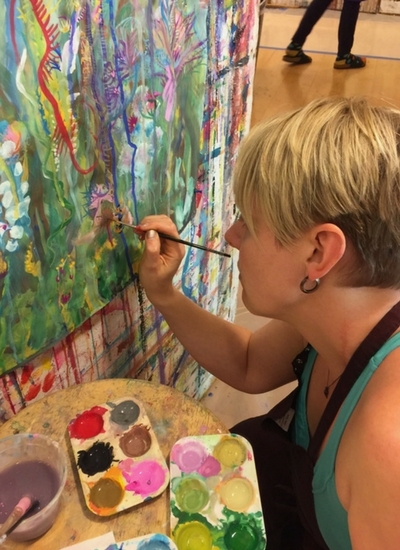 People from all over the world show up at Painting Experience workshops, many with accomplished lives. From physicists to therapists, from tech workers to teachers to screenwriters—a tremendous variety of human experience and history is represented in the studio, and it’s truly impressive that each person is willing to return to the ground of original innocence. I purposely have people not speak about themselves when we first begin a workshop. Labels immediately create images that separate. In a process painting studio, no one is more accomplished than anyone else. 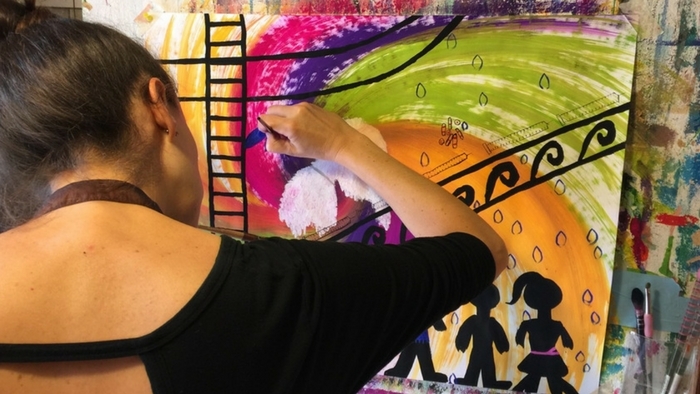 For an adult, approaching a blank canvas without an agenda requires a courageous openness. We usually equate intelligence with knowledge, proficiency with certainty, success with accomplishment. To be open to true exploration means not knowing, not being certain, and not working for a result. We immediately feel the pressure of performance: I’m open to whatever arises, as long as it’s clever, a subtle voice whispers in our ear. I’ll take the risk of beginning without a theme, but I hope it quickly turns into something, another voice intones. I’ll start with some happy colors, I don’t want anyone to think I’m depressed, a third voice interjects. The demand to protect our self-image has profoundly infiltrated every nook and cranny of our motivations. It’s not easy to drop the barriers of identity and embrace our own innocent expression. To enter the free field of unknown outcome is a true hero’s journey. As we say goodbye to 2017, here are our five most-visited blog posts from the past year. If you missed any of them, you might enjoy taking a look . . . Listening to what our bodies want to do is a new way for most of us to pay attention but, when we are able to do it, we realize the information is often readily available and easy to read. Risk taking and experimentation are part of the creative process. No matter which work-a-day world you live in, these traits of creative expression are key to enlivened, energizing and effective work. Resistance is just a knock on the door. A call to wake up. Listen, it’s saying. I want you to paint this. And then follow me, because I have something to show you. You’re going to not know and maybe not like what you’re doing for a while. But you can trust this. The intimate moments of courage, surrender and breakthrough that the painting process so naturally calls forth will lead to changes in the way we perceive and act. The paintings, at a certain point, jump off the page, showing us the way to a more courageous and meaningful participation in the world. A step-by-step guide to creating the easels we use in our on-site painting workshops. We hope to see you in 2018! 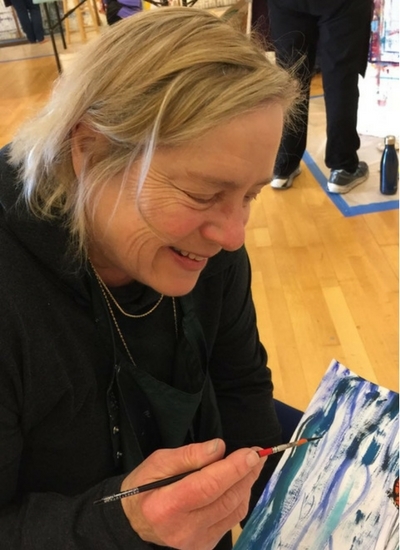 To find out about opportunities to participate in The Painting Experience, see our schedule of upcoming process painting workshops and online painting classes.